We hope you are having a good week. We know many of you are looking forward to the Phoenix Marathon this coming weekend! Looks like perfect running weather for Sat! 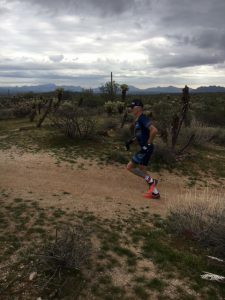 Last weekend, the long-running Desert Duathlon was held. Peter Ney (pictured) raced the Powerman Distance (10K run, 60K bike, 10K run) and took 5th overall male and 2nd in his AG! Joan McGue raced the Standard Distance (5K, 38K, 5K) and finished the difficult course in 3:14, taking 2nd in her AG! This entry was posted in Results on February 8, 2019 by tekgrl_admin.